Where do I use my Looking4Parking voucher code? Copy the code you would like to use at NetVoucherCodes and follow our link to the Looking4Parking website. In the search box, you can enter your code into the form, click compare prices to see your discount automatically applied. Choose the option that suits and continue with your booking. "Up to 60% off airport parking." "Discover great discount codes and deals here at NetVoucherCodes." As the world's leading airport comparison brand, find Airport Parking, Hotels & Transfer deals quick and easy today! Start comparing and saving right now. 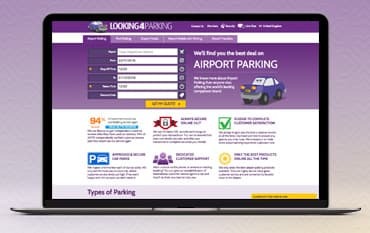 Looking4Parking know more about Airport Parking than anyone else, offering the world's leading brands. When it comes to going on holiday, parking you car can cause unnecessary stress right before you jet off. Looking4Parking want to remove the stress of parking so you can enjoy your holiday to its full potential without having to worry about the whereabouts of your car and the cost of parking. Meet & Greet is the quickest and most convenient way of parking at the airport. Simply drive to the terminal entrance, meet the driver, take your luggage and away you go. Alternatively, Park & Ride is the cheapest option! One you have parked your car in a designated area, take the 5 - 10 minute transfer on the free shuttle. Finally, Onsite Parking is provided by the airport itself. Booking in advance can give you the best price possible. At Looking4Parking, they understand that some travellers need accommodation before they fly for a variety of reasons! This is why there are hotels dotted around the surrounding areas of your airport. Looking4Parking have made it easy for you to find a hotel close by to the airport you're flying from at a price you can afford. You can even find Hotel & Airport Parking packages making your stay cheaper and offering complete peace of mind before you fly. Find Airport hotels across 26 different Airports in the UK today! All flexible bookings can be amended. Please visit the members area online to do this. Do I need to print out my confirmation email? We strongly recommend that you do print out your confirmation, so that you can have it with you on the day of travel and return. If you do not have a printer, save the booking reference and have the email to hand on an electronic device and be sure to know how to use the service that you have booked. What is the telephone number for the car park that I have booked? All car park contact numbers are on your confirmation e mail. Looking4Parking is the place to book for cheap Airport Parking. Book in advance for great savings on lots of Airports including Gatwick, Heathrow, Manchester, Liverpool and many more. Why not use their Meet and Greet service if you want to take away some of the stress of your Journey, plus with our Looking4Parking Discount Codes you could save even more. You can also book an Airport Hotel at Looking4Parking with some great rates available so whatever type of parking package you are wanting there is plenty to choose from at Looking4Parking. We are constantly on the hunt for Discount Codes for Looking4Parking to help you with your money saving. Our experts check dozens of sites for secret codes including NHS discounts, student sites & social media channels saving you time & money!